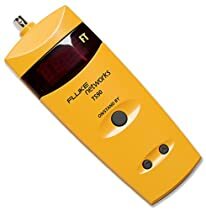 The Fluke Networks 26500090 is a TS90 cable fault finder that easily finds the distance to opens or shorts on electrical wire, telephone wire, security wire and coax. This product saved me a bundle of cash and time. I had a troublesome coaxial cable problem that was intermittent in a section of 400 feet of buried cable. The Fluke TS-90 helped me to localize the problem to within 10 feet, the readings fluctuated probably because of the varying moisture conditions in the cable. I purchaed a Fluke Pro3000 Toner and Probe to get a more accurate fix of the problem, but that was no help. Using the TS-90 initial location indications I went to the nearest old cable splice; I respliced and sealed the cable junction and the problem totally disappeared. I am very happy with the TS-90 because I was able to locate the cable problem without several cable excavations or splicing operations. I agree with a previous review, that this unit is not quite for Aerospace. The appropriate TDR's are much too expensive though, making this type of TDR (budget-minding-handheld) better than nothing. To be fair, here are three good reasons why the Triplett 3271 is subpar for Aerospace: 1) The test button must be pressed to take a reading and the moment you let go the value is gone. 2) The unit does not appear to do real-time sampling, it only seems to take a snapshot of the moment at which you press to test. 3) The LCD display seems large enough, however, the font is small and since the display is not backlit it is difficult to read the values when testing in tight or otherwise difficult to access locations. Otherwise, again to be fair, the unit does work as intended. It will aid you in finding faults with a reasonable margin of error, for the price paid. To get a high degree of accuracy one must pay a thousand dollars US or likely more for a high-end TDR. Though, there is a very good alternate to this Triplett 3271. The Fluke TS90 goes for about the same price and can do everything that the Triplett can do, except that it will solve the three things that I have listed above. The Fluke TS90 continuously tests the moment you turn it on and hook it up (no need to hold any button, just turn it on), it will sample 4 to 2 times per second depending on the cable/wires being tested (so if there is an intermittent fault, your value will change real-time), and the LED display has large bright red font (clearly visible in dark environments). The Fluke TS100 will cost more than the TS90 by about $100 US, but it will read up to 500' more of cable length. 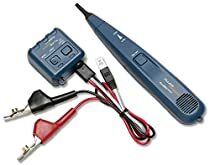 I was very happy with the Fluke TS90, used it with success on B757's for checking antenna coax and 22-gauge twisted pair wires. If you are looking for a budget-minding TDR, get a FLUKE TS90 or TS100. Triplett needs to upgrade their 3271.